The problems Greece is experiencing stem from overly generous public welfare and pension programs. Greece has been in a financial crisis since 2009, when leaders admitted that they had been underreporting public debt. 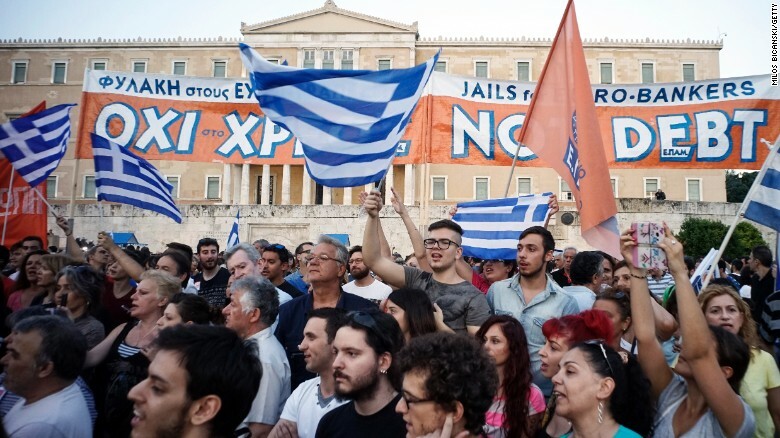 With country's public debt at nearly 150 percent of gross domestic product (GDP) and the government on the verge of bankruptcy, European countries and the IMF, in May 2010, bailed out Greece to the tune of $145 billion. This was followed by a second bailout worth $170 billion in March 2012. The bailouts came with strings attached, of course. Greece, whose debt is now at 175 percent of GDP with annual government expenditures at 52 percent of GDP, implemented deep austerity measures that included spending cuts, tax increases, and increases to the retirement age to slow the flood of red ink in exchange for the financial assistance. In the most recent package, European countries and the IMF were seeking more austerity measures, including a rollback of a minimum wage hike enacted earlier this year by the government, which is controlled by the socialist Syriza party, and more reforms to the country's pension programs. Greek Prime Minister Alexis Tsipras, who urged a "no" vote, is gambling with the results of the referendum to try to negotiate a deal more amenable to his socialist government. Greece should serve as a warning for countries with heavy government spending and large public welfare programs. The United States, for example, may not be experiencing a significant debt crisis now, but it could if Washington does not get serious about the fiscal threats that entitlement programs, such as Social Security and government healthcare programs, represent over the next few decades. In June, the Congressional Budget Office (CBO) released a publication, The 2015 Long-Term Budget Outlook, that presented two different scenarios for the United States' economy over the next 25 years. Neither scenario presents a rosy picture for the future unless the course is altered in a significant way. 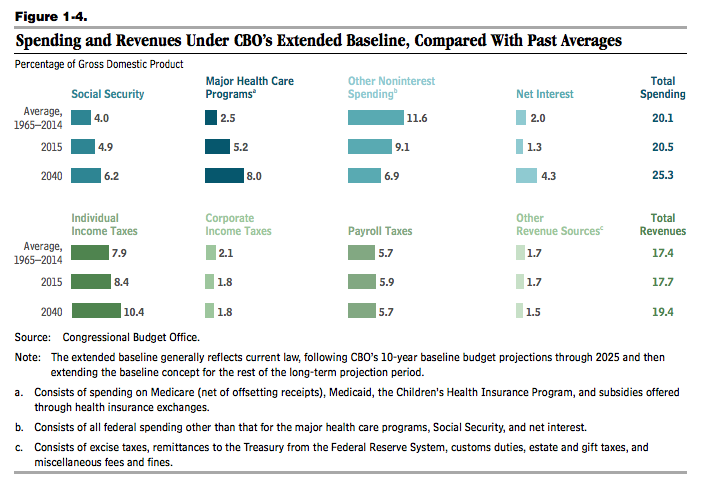 Granted, long-term budget projections are incredibly difficult to determine, but the CBO assumes that current tax and spending policies will not change. Currently, the United States spends 20.5 percent of GDP and collects revenues of nearly 18 percent of GDP. By 2040, revenues are expected to reach 19.4 percent but spending, because of the growth of Social Security and healthcare programs, is expected to exceed 25 percent. As the chart below notes, from 1965 to 2014, spending and revenues averaged 20.1 percent and 17.4 percent. The public's share of the national debt will rise from its current 74 percent of GDP to 103 percent by 2040. Such a large amount of debt, which would not have been seen since World War II, would have serious consequences, such as crowding out private investment, slowing the economy, and making it more expensive for the federal government to service debt. "[T]he larger a government’s debt," the CBO notes, "the greater the risk of a fiscal crisis." The CBO also included an "extended alternative fiscal scenario," which assumes many current policies slated to expire will be extended by Congress, and others -- such as the cuts to the rates of spending increases under the Budget Control Act of 2011, which have been targeted by members of both parties -- will be eliminated. This scenario is much more dire, and it may be closer to the long-term realities facing the United States if lawmakers in Washington do not begin to take the situation seriously. Under the "extended alternative fiscal scenario," tax revenues would be around 18 percent of GDP and spending would exceed 30 percent. The result is not too far off, in terms of a debt crisis, to what Greece is experiencing today. "With the effects of lower output and higher interest rates incorporated," the CBO explains, "federal debt held by the public under the extended alternative fiscal scenario would reach 175 percent of GDP in 2040." Recall that Greece's national debt is currently 175 percent of GDP. We may behind Greece for now, years away from any debt crisis on par with what its citizens are experiencing, but that should not lure us into complacency. Not long after the Mediterranean country's debt crisis first reared its head, in May 2010, Thomas Hoenig, then-President of the Federal Reserve Bank of Kansas City, remarked, "Greece is a lesson for us, in the sense that we shouldn't be so, if I may say, so arrogant to think that that couldn't happen to us or others." The scenarios the CBO presents in its report are not sustainable. Unfortunately, too few politicians on Capitol Hill are concerned about the impact of preserving the status quo, which is the road to economic calamity for the United States. Sure, they talk about it when they are at home meeting constituents or on the campaign trail mingling with voters, but actions speak louder than words. And what we have seen in Washington is a lot kicking the can down the road, and it has been going on for far too long. Eventually, Congress is going to run out of road, much like Greece has, unless they change directions.